God is good. 'Taste and see that the Lord is good,' the Psalmist writes (Psalm 34:8). And to those who called him good, Jesus said, 'No one is good - except God alone (Mark 10:18).Christopher Holmes explores the divine attribute of God's goodness by offering a theological interpretation of the Psalter and engaging with the church's rich theological tradition, especially Augustine and Aquinas. He contends that in the very depths of God's being, God is goodness itself, and goodness is preeminent in God's nature. Thus, he argues that God not only does good, as seen in the person and work of Jesus Christ, but that God is good such that the good that God does - and that God calls us to do - is anchored in the fullness of good that God is.Leading us in this journey through the Psalms and the church's tradition, Holmes helps us to understand what it means to make that simple affirmation: God is good. 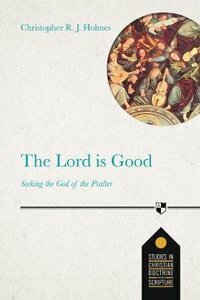 About "Lord is Good, The: Seeking the God of the Psalter (Studies In Christian Doctrine And Scripture Series)"